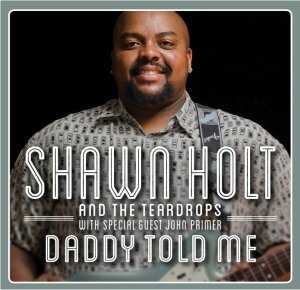 When Magic Slim passed away one might have thought that the Teardrops would disband but no, Slim’s son Shawn Holt joined the band (just before his father’s death) and this new CD is the first recorded evidence of how well Shawn can do in his father’s footsteps. The short answer is very well indeed as the new band has cut an excellent album by any standards and, more importantly, an album that will satisfy long-term fans of the band. Shawn plays guitar and takes most of the lead vocals, Levi William plays second guitar and shares vocals on one track, Chris Biedron is on bass and Brian ‘BJ’ Jones is on drums. Chicago stalwart John Primer, himself a former Teardrop, guests on guitar on two tracks and sings lead on one of those. The material is a well-judged mixture of five of Shawn’s own songs, two of his Dad’s tunes and some well-known covers. A sad footnote is that the album was produced by Michael Blakemore, Junior Wells’ nephew, who passed away a few weeks ago. Buster Brown’s “Fannie Mae” opens the album, Shawn picking out the familiar riff while the band sets off on a typical Teardrops strut. Shawn’s voice has some of the characteristics of his father’s but is more expressive and has a wider range, so this is an excellent choice to open proceedings. A brace of Shawn’s own songs follow, in differing styles: Shawn’s biographical song “Daddy Told Me” is a churning blues shuffle, Shawn recounting some of his Dad’s advice – notably “…never love a woman twice – when she comes back around, something ain’t right”. “Hold You Again”, a co-write with Levi William, is a slower blues, the two guitarists playing nicely against each other. The band romp through Jimmy Reed’s “Down In Virginia” with Levi duetting on vocals with Shawn, the band setting a terrific pace, another highlight of the album. Levi sits out the two tracks on which John Primer plays. Magic Slim’s “Buddy Buddy Friend” is a pessimistic song in which Slim advises against trusting people who may let you down and the two guitars play well in tandem. John’s other track is a remake of Bo Diddley’s “Before You Accuse Me” on which he sings lead and shares guitar duties with Shawn. It is, of course, a song that Slim covered as did Eric Clapton and Delbert McClinton, but this is a fine version. The Teardrops tear it up on Albert Collins’ “Get Your Business Straight” and also tackle Junior Wells’ “Little By Little”, a song that is covered so often it is hard to find anything new to say though Shawn’s guitar is excellent on this version. There is also one further Magic Slim song “Please Don’t Dog Me” which opens in almost acoustic mode before the heavy central riff comes in and Shawn nails his guitar and vocal. That leaves three more Shawn Holt originals to discuss. “Mean Little Woman” is a solid shuffle with some lighter touches from both guitarists. “Love Got Me Walkin’” is more of a classic Teardrops production, Levi’s rhythm guitar setting the pace and allowing Shawn to play some slide over the riff. “You Done Me Wrong” is an Elmore James style piece with some expressive vocals and guitar from Shawn, a good album closer. It is very hard to take over from an icon like Magic Slim but Shawn Holt has done a good job here, keeping plenty of the characteristics that Magic Slim fans loved but bringing his own attributes to the table as well. This CD is likely to be on the shortlist for next year’s Blues Blast nominations for Traditional Blues album of the year.